Being able to have all of your gear with you during hunts or on when you are on the range will drastically improve your experience. The last thing anyone wants is to be out in the wilderness and be without something that is essential to their adventure. Carrying bags are a great way to keep everything you need close and safe. Carrying bags are good for hauling all of the equipment you could use for your next range or hunting expedition. Carrying bags come in a variety of shapes and sizes and are versatile for a number of uses. They range in size from as small as a fanny pack for carrying easy-to-access necessities on your waist to large duffel bags that can haul nearly everything you need in one bag. Because of the vast range of carrying bags available, you will want to consider what your primary use for one will be. Do you need something that can carry nearly all of your gear because you do not have another bag, or do you need to be able to keep some smaller important items close? Many bags are weatherproof, so consider the conditions you will be using your bag in to help determine what materials you should look for. Another aspect you may want to consider is how you want to carry the bag. There are several that can be worn like a backpack, while others have a convenient shoulder strap. Nearly all of them have a handle to be carried by the hand. 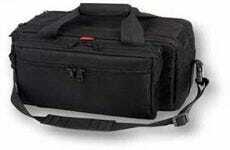 When you are looking for an easy way to carry your weapons and weapon accessories, consider a carrying bag. They are the ideal way to make sure you have everything you need with you. GrabAGun.com has a wide selection of carrying bags for you to pick from.